The FPUDX1700 series has been discontinued. Please contact our Flow Engineering department. 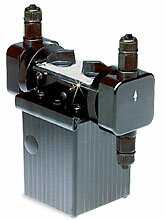 FPUDX1700 Series duplex head injector pumps feature dual, side-mounted heavy-duty cartridge valve heads. This durable liquid end is injection molded of polypropylene and includes: Double-sealed PVDF cartridge valve fittings, FKM O-ring seals, ceramic ball checks, Hastelloy valve springs, and a PTFE /EPDM diaphragm. Each head is independently controlled by an easy-to-adjust, top-mounted feed adjustment. These pumps are suitable for a variety of applications, including: to inject different amounts of simular chemicals into separate systems; feed two different chemicals into the same system or feed different chemicals into separate systems; or when a single-head pump does not provide sufficient output. 참고: Comes complete with check valves, flow indicator, injection and foot valves, 1.5 m (5') each of vinyl suction tubing and polyethylene discharge tubing, and operator’s manual. For 230 V/60 Hz, add suffix "-230V60" to model number; add $10 to price. For 220 V/50 Hz, add suffix "-220V50" to model number (Max. GPD decreases by 20%), add $10 to price. For 24 V/60 Hz, add suffix "-24V60" to model number; add $10 to price.